Prominent Jewish family, members of which lived during the sixteenth and seventeenth centuries chiefly in Turkey and Egypt. Most probably it took its name from one of the two Spanish cities named Medina. Cabalistic author; flourished at the beginning of the eighteenth century. He wrote: "Nefesh Dawid" (Constantinople, 1736), a cabalistic commentary on the Pentateuch and the Five Scrolls; and "Ruaḥ Dawid we-Nishmat Dawid" (Salonica, 1747), in two parts, the first being a commentary on the part of the Zohar called "Iddera Rabba," and the second a cabalistic commentary on Canticles. Zedner, Cat. Hebr. Books Brit. Mus. p. 516. Editor of a prayer-book for the congregation of Sienna, arranged and published by him with the cooperation of Jedidiah Levi under the title "Seder Zemirot," Leghorn, 1786. Zedner, Cat. Hebr. Books Brit. Mus. pp. 484, 516. Son of Isaac Ḥayyim (No. 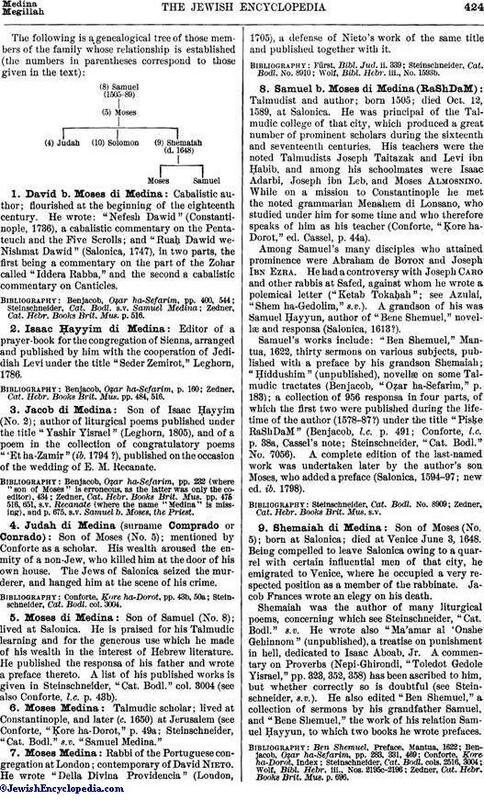 2); author of liturgical poems published under the title "Yashir Yisrael" (Leghorn, 1805), and of a poem in the collection of congratulatory poems "'Et ha-Zamir" (ib. 1794 ? ), published on the occasion of the wedding of E. M. Recanate. Zedner, Cat. Hebr. Books Brit. Mus. pp. 475, 516, 651, s.v. 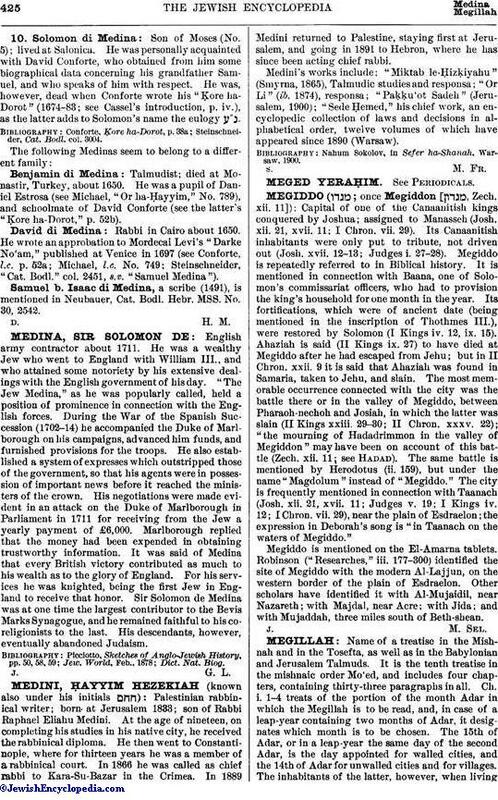 Recanate (where the name "Medina" is missing), and p. 675, s.v. Samuel b. Moses, the Priest. Son of Moses (No. 5); mentioned by Conforte as a scholar. His wealth aroused the enmity of a non-Jew, who killed him at the door of his own house. The Jews of Salonica seized the murderer, and hanged him at the scene of his crime. Steinschneider, Cat. Bodl. col. 3004. Son of Samuel (No. 8); lived at Salonica. He is praised for his Talmudic learning and for the generous use which he made of his wealth in the interest of Hebrew literature. He published the responsa of his father and wrote a preface thereto. A list of his published works is given in Steinschneider, "Cat. Bodl." col. 3004 (see also Conforte, l.c. p. 43b). Talmudic scholar; lived at Constantinople, and later (c. 1650) at Jerusalem (see Conforte, "Ḳore ha-Dorot," p. 49a; Steinschneider, "Cat. Bodl." s.v. "Samuel Medina." Rabbi of the Portuguese congregation at London; contemporary of David Nieto. He wrote "Della Divina Providencia" (London, 1705), a defense of Nieto's work of the same title and published together with it. Wolf, Bibl. Hebr. iii., No. 1593b. Talmudist and author; born 1505; died Oct. 12, 1589, at Salonica. He was principal of the Talmudic college of that city, which produced a great number of prominent scholars during the sixteenth and seventeenth centuries. His teachers were the noted Talmudists Joseph Taitazak and Levi ibn Ḥabib, and among his schoolmates were Isaac Adarbi, Joseph ibn Leb, and Moses Almosnino. While on a mission to Constantinople he met the noted grammarian Menahem di Lonsano, who studied under him for some time and who therefore speaks of him as his teacher (Conforte, "Ḳore ha-Dorot," ed. Cassel, p. 44a). Among Samuel's many disciples who attained prominence were Abraham de Boton and Joseph Ibn Ezra. 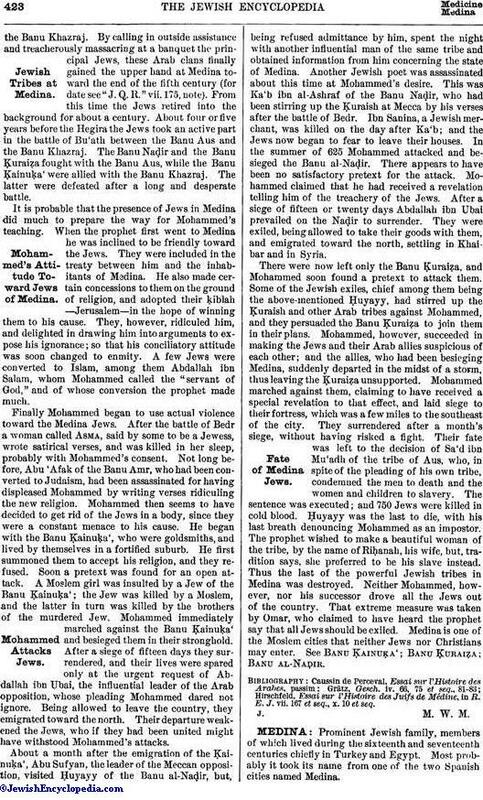 He had a controversy with Joseph Caro and other rabbis at Safed, against whom he wrote a polemical letter ("Ketab Tokaḥah"; see Azulai, "Shem ha-Gedolim," s.v.). A grandson of his was Samuel Ḥayyun, author of "Bene Shemuel," novellæ and responsa (Salonica, 1613?). Samuel's works include: "Ben Shemuel," Mantua, 1622, thirty sermons on various subjects, published with a preface by his grandson Shemaiah; "Ḥiddushim" (unpublished), novellæ on some Talmudic tractates (Benjacob, "Oẓar ha-Sefarim," p. 183); a collection of 956 responsa in four parts, of which the first two were published during the lifetime of the author (1578-87?) under the title "Pisḳe RaShDaM" (Benjacob, l.c. p. 491; Conforte, l.c. p. 38a, Cassel's note; Steinschneider, "Cat. Bodl." No. 7056). A complete edition of the last-named work was undertaken later by the author's son Moses, who added a preface (Salonica, 1594-97; new ed. ib. 1798). Son of Moses (No. 5); born at Salonica; died at Venice June 3, 1648. Being compelled to leave Salonica owing to a quarrel with certain influential men of that city, he emigrated to Venice, where he occupied a very respected position as a member of the rabbinate. Jacob Frances wrote an elegy on his death. Shemaiah was the author of many liturgical poems, concerning which see Steinschneider, "Cat. Bodl." s.v. He wrote also "Ma'amar al 'Onshe Gehinnom" (unpublished), a treatise on punishment in hell, dedicated to Isaac Aboab, Jr. A commentary on Proverbs (Nepi-Ghirondi, "Toledot Gedole Yisrael," pp. 323, 352, 358) has been ascribed to him, but whether correctly so is doubtful (see Steinschneider, s.v.). He also edited "Ben Shemuel," a collection of sermons by his grandfather Samuel, and "Bene Shemuel," the work of his relation Samuel Ḥayyun, to which two books he wrote prefaces. Zedner, Cat. Hebr. Books Brit. Mus. p. 696. Son of Moses (No. 5); lived at Salonica. He was personally acquainted with David Conforte, who obtained from him some biographical data concerning his grandfather Samuel, and who speaks of him with respect. He was, however, dead when Conforte wrote his "Ḳore ha-Dorot" (1674-83; see Cassel's introduction, p. iv. ), as the latter adds to Solomon's name the eulogy . Talmudist; died at Monastir, Turkey, about 1650. He was a pupil of Daniel Estrosa (see Michael, "Or ha-Ḥayyim," No. 789), and schoolmate of David Conforte (see the latter's "Ḳore ha-Dorot," p. 52b). Rabbi in Cairo about 1650. He wrote an approbation to Mordecai Levi's "Darke No'am," published at Venice in 1697 (see Conforte, l.c. p. 52a; Michael, l.c. No. 749; Steinschneider, "Cat. Bodl." col. 2451, s.v. "Samuel Medina"). a scribe (1491), is mentioned in Neubauer, Cat. Bodl. Hebr. MSS. No. 30, 2542.